While the vitriolic politics of a big election can be hard to take, there is nothing like electing a president to teach kids about politics, elections, and government. 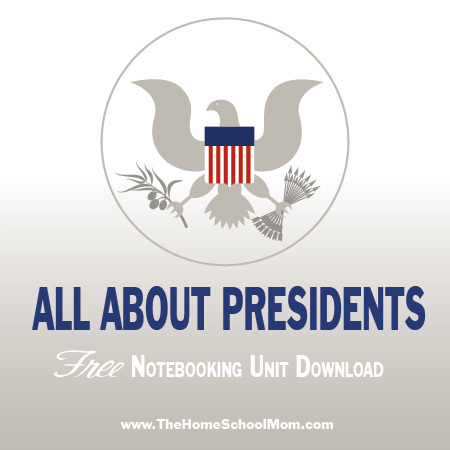 As a newsletter subscriber, you have access to several quality notebooking units and workbooks from TheHomeSchoolMom. 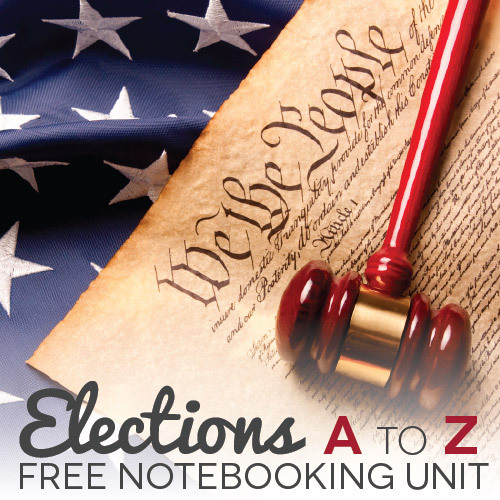 If you haven’t don’t so, you can download copies of our free unit studies about elections and presidents at the link below. Just enter your subscribed email address and morningcoffee as the password. We ask that you don’t share the downloads with friends, but instead point them to that page where they can subscribe and download all of the resources. Elections are also a great time to discuss the importance of critical thinking with your students. Understanding worldview and confirmation bias is good preparation for college (and for adulthood in general), and election time — when opposing views and dubious claims are being shouted by both sides — is the perfect time to emphasize critical thinking. From the NYT Learning Network, this unit for eighth graders has students “analyze Aristotle’s modes of rhetoric and consider how to construct a persuasive argument. Then, they select their own topics and engage in the writing process to produce their own editorials.” The focus on deep thought, quality research, and constructing their position will equip students with the writing skills needed to effectively communicate and defend an argument. If you’d like, you can use the unit in conjunction with the Times’ Student Editorial Contest. If you have never used Google Earth (not to be confused with Google satellite maps), you are missing out on one of the coolest tools available to interest your kids in geography. Heather at Blog, She Wrote has put together this guide to using the tool, which is a free download from Google. Google Earth is available for use on PC, Mac, or Linux desktop operating systems as well as Android and iOS mobile devices. It can be used for things like Google Lit Trips, a collaboration where you can download files (free registration required) with the locations in books mapped out in Google Earth to be used as an interactive tour of the places in the book (this article offers a better explanation than the site itself). For starters, though, there is nothing like opening Earth and zooming in on your own house! Time For Kids is a resource from Time Magazine highlighting current events, holidays, social and environmental issues, country facts, a homework helper, and more. Their Mini-Sites include resources for learning more in greater depth and is a great place to find resources for Women’s History Month this month. Other TFK Mini-Sites include Space, Black History Month, Antarctica, Native American Heritage Month, Hispanic Heritage Month, and more. When people who don’t know anything about homeschooling start talking about why it can’t work, one of their criticisms is that homeschooling parents can’t possibly know enough to homeschool the “hard” subjects of high school, which is why homeschooled kids won’t ever get into college. Of course, this would be a shock to all the homeschooled kids who’ve not only been accepted to college, but also already graduated. But what I mean to talk about is, how does the learning happen? I mean, one of my sons speaks pretty fluent Spanish, but I don’t. Another of my sons writes code, but I can’t. Another son is an excellent musician, but I’m not. 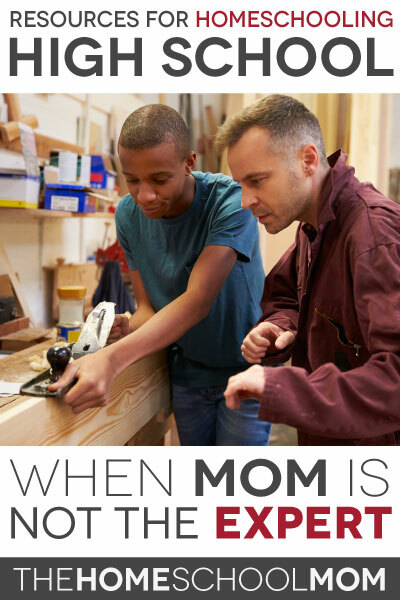 How do homeschoolers learn things that their parents don’t know anything about? Just a little research in the world of homeschoolers can show people that homeschooling parents don’t have to teach everything their children are learning. They just have to facilitate opportunities so their kids can learn.